Constantius, surnamed Chlorus was the son of Eutropius and Claudia, daughter of Crispus. He was one of the two Caesars appointed by Maximian and Diocletian in 292, and received the government of Britain, Gaul, and Spain with Treviri as his residence. He married Theodora. He died in July, 306 at York, in Britain, on an expedition against Picts. 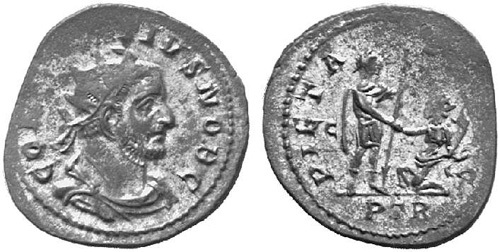 Obverse: CONSTANTIVS NOB C, Radiate, draped, and cuirassed bust right. Reverse: ORIENS AVGG, Sol standing left, right hand raised, left holding whip. Mintmark: B.
Obverse: FL VAL CONSTANTIVS NOB C, Radiate, draped, and cuirassed bust right. Reverse: PROVIDENT DEOR, Providentia standing left, holding baton and sceptre; at foot, globe. Mintmark: A. Reverse: PROVIDENT DEOR, Providentia seated left, holding wand over globe and sceptre. Mintmark: II. 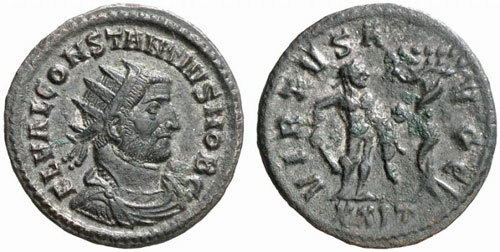 Obverse: CONSTANTIVS NOB C, Radiate bust left, wearing imperial mantle and holding eagle-tipped sceptre. Reverse: VIRTVS AVGG, Captive seated on either side of trophy; B. Reverse: PIETAS AVGG, Prince standing right, holding spear and raising kneeling turreted woman who holds cornucopiae. 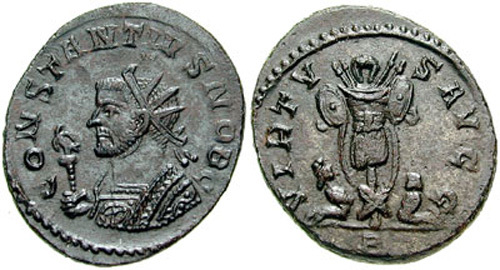 Obverse: FL VAL CONSTANTIVS NOB C, Radiate, draped and cuirassed bust right. 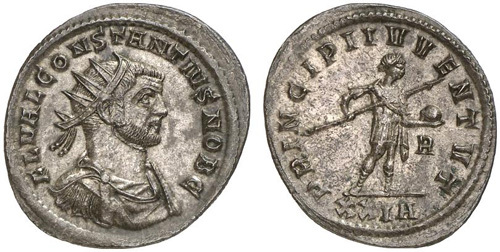 Reverse: PRINCIPI IVVENT, Constantius in military attire, chlamys over left shoulder, standing right, holding transverse spear in his right hand, globe on his extended left hand; A / XXIA. Reverse: VIRTVS AVGG, Hercules standing right, holding club, in the Garden of Hisperides with the dragon Ladon to right entwined around the golden-apple tree, XXIT in exergue. 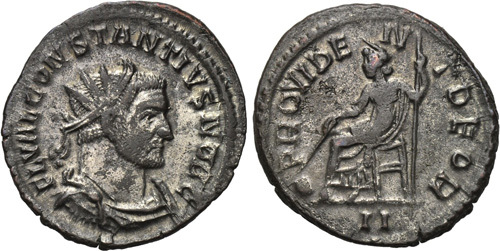 Reverse: PRAESIDIA REIPVBLIC, Constantius and Galerius standing facing one another, with one receiving Victory on globe from the other, and each holding scepter; between, bound captive seated right; XXIA. Obverse: FL VAL CONSTANTIVS NOB CAES, Radiate, draped and cuirassed bust right. Reverse: IOVI ET HERCVLI CONS CAES, Jupiter standing right with long sceptre and globe, facing Hercules standing left, holding Victory, club and lion's skin; S/XXI. Reverse: IOVI ET HERCVLI CONS CAES, Jupiter standing right with long sceptre and globe, facing Hercules standing left, holding Victory, club and lion's skin; A/XXI.